This article is about how to upload images in Coassemble using the ‘Add Image’ button. This article is about how to upload images in Coassemble using the ‘Add Image’ button. For information on how to add images using your text editor, please click here. Finding and inserting images using the ‘Add Image’ button is easy. The ‘Add Image’ button can be found in all templates that require an image. For more information on how to use specific templates, please click here. Step 1: Click the ‘Add Image’ button. From this screen, you can add images in 3 different ways. Once you search for an image, a variety of options will appear below the search bar. Note: The ‘Google Image Search’ uses Creative Cloud software, meaning that all images that appear are free to use and without copyright. Click on the image you’d like to use and it will appear to the right of screen, under the ‘Your Image’ section. Note: If you don’t see an image you’d like to use, you can keep searching, scroll down further, or choose an image using one of the other 2 options that we’re about to discuss. From here, you are shown two copies of your image. Use the zoom bar or drag the corners of the image (highlighted above by an orange square) to crop your image. The grey rectangle tells you what size your new image will be, with ‘W’ referring to width, ‘H’ referring to height, and ‘S’ referring to scale. 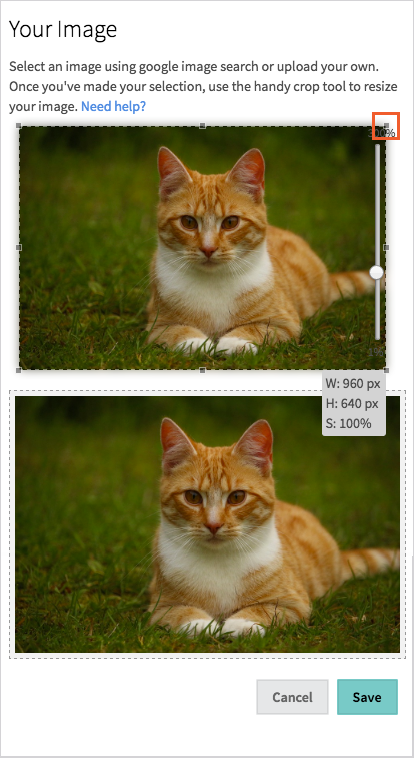 The bottom image will change as you crop your image to preview what your final image will look like. When you’re done cropping, select ‘Save’ to finish uploading your image. 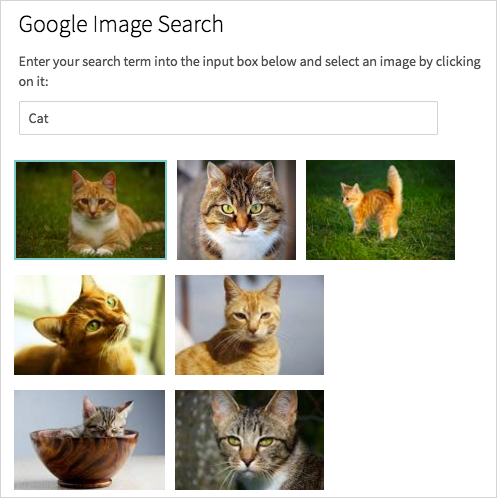 From here, you can search for an image exactly the same way as with the ‘Google Image Search’ function above. When you’ve found the image you like, simply click it and crop it the same way you would do as if following Method 1. Note: The ‘Flikr Image Search’ uses Creative Cloud software, meaning that all images that appear are free to use and without copyright. 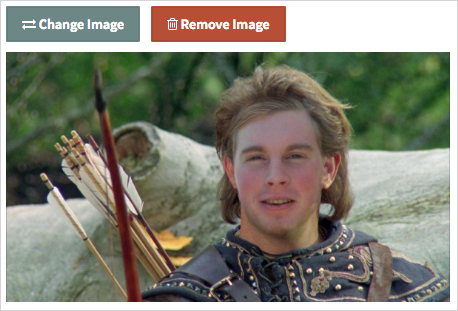 Method 3: The third way to add images is by uploading them yourself. To do this, click on the ‘Upload your own image’ button, highlighted below. The Upload Image screen will pop up. From here, click on the ‘Upload Image’ button to begin uploading your image. Your computer’s default upload box should pop up – from here, simply find and upload your image as you usually would from your computer. Your image will appear in the left hand side of the screen, ready to be cropped. From here, just follow the same process as with Method 2 and Method 3, and select ‘Save’ to finalise your upload.